Albania has won the 14th annual edition of ChatVote, the traditional event held by escgo! and the #esc chatroom to find our favourite song ahead of each year’s Eurovision Song Contest! In the 2018 edition, “Mall” by Eugent Bushpepa received a total of 412 points, ahead of AWS from Hungary in second place (342 points) and Sennek from Belgium in third place (181 points). Meanwhile, San Marino propped up the table, receiving 25 points in last place. 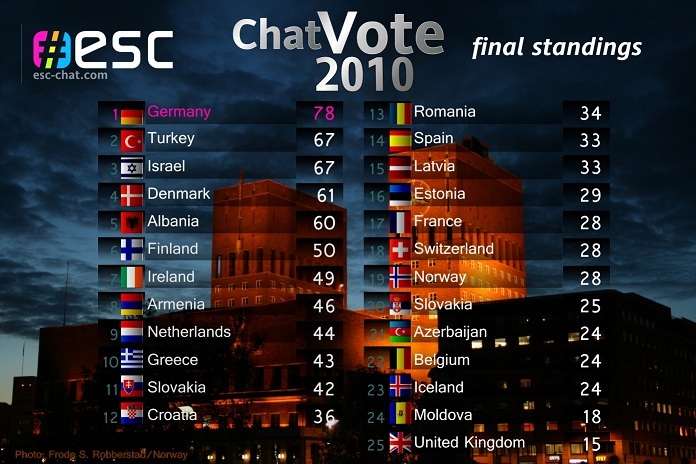 Repeating the new ChatVote concept we introduced two years ago, 50% of the total score was determined by “juries” – regular chatters who gave their votes in ESC-style (12-10-8…) – and 50% by “televoting”, which took the form of a fast-paced poll that was held live in the chat at the start of the grand final, with everyone attending the event welcome to participate and submit as many votes as possible in the five-minute voting window. 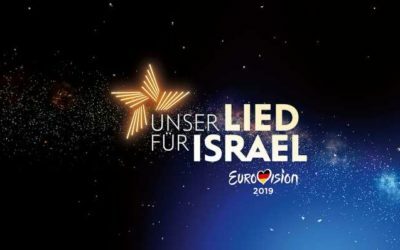 This year’s big fan favourite, Israel, narrowly won our jury vote but with only a handful of top marks, so it was perhaps no surprise to see it fail to perform quite as well in the televote – but there was shock in the chat as it was left behind completely. Perhaps everyone expected someone else would vote for it? Meanwhile, Albania (which had finished a close second in the jury vote anyway) and Hungary benefited from huge support from the chatters in attendance on the night. The televote system allows people to either spread their votes around several entries or concentrate their votes on their one big favourite, and unlike in previous years, it seems the latter is very much what happened tonight. 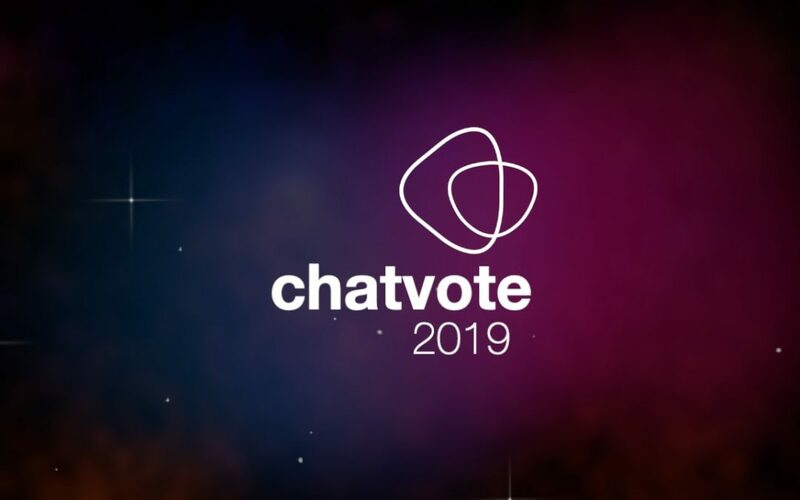 In any case, the live-streamed scoreboard accompanying the televoting reveal was a fitting highlight to an exciting night in the chat – and we’d like to say thanks to everyone who attended and took part throughout the various events of ChatVote 2018. 1. Israel and Greece, 3. Albania, Czech Republic, Austria and Armenia, 7. Lithuania, 8. Belgium, Bulgaria and Macedonia || 11. Cyprus, 12. Estonia, Finland and Ireland, 15. Azerbaijan, 16. Belarus, 17. Iceland and Switzerland, 19. Croatia. 1. Australia, 2. Romania, 3. Denmark and Sweden, 5. Montenegro, 6. Moldova and Georgia, 8. Hungary, 9. Ukraine and San Marino || 11. Norway, Latvia and Slovenia, 14. Netherlands and Malta, 16. Serbia, 17. Poland, 18. Russia. For the record, Australia was the only song to receive a vote from every single person who voted in the respective semi-final. Meanwhile, unlike last year when Lithuania’s Fusedmarc were left empty-handed, every single song received a vote from at least one of our chatters. Hurrah! So that’s all until 2019 – although there is the small matter of the 2018 Eurovision Song Contest for us to enjoy first. And while the #esc ChatVote is very much a preference poll, it can be fun to look back and see how our taste has corresponded to Europe’s over the years. As the ChatVote history shows, Albania’s victory may not necessarily be an omen of success in Lisbon next month, but there is a possibility we might have got it “right” – just ask Lena, Loreen, or indeed last year’s ChatVote winner Salvador Sobral! In reality, though, qualification for the ESC final will already be a victory for Albania, and on behalf of our chatters we wish Eugent Bushpepa all the best with that. And now, enjoy our winning song one more time! 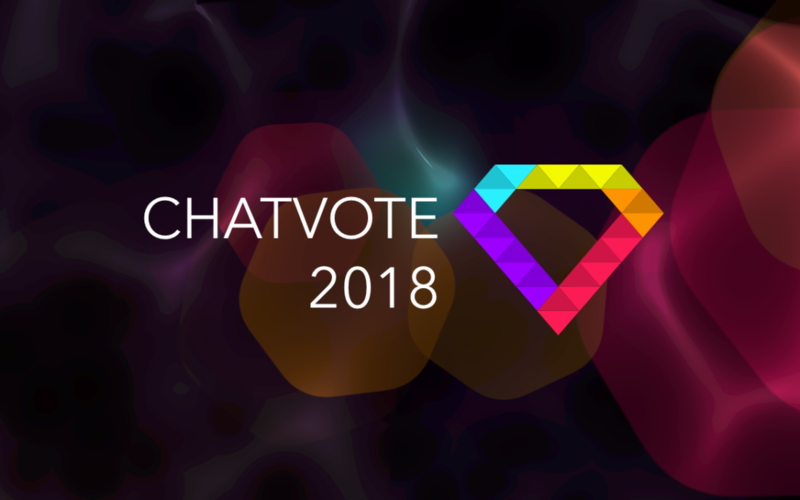 ChatVote 2018: Qualifiers revealed, final voting begins! Following two nights of preview video viewing, live voting and opening of virtual envelopes in our live stream, the semi-final qualifiers that will compete in our ChatVote 2018 final are now known! Semi 1 qualifiers: Armenia, Albania, Austria, Belgium, Bulgaria, Czech Republic, Greece, Israel, Lithuania, Macedonia. Semi 2 qualifiers: Australia, Denmark, Georgia, Hungary, Moldova, Montenegro, Romania, San Marino, Sweden, Ukraine. As in the last two years, the final voting will be split into “juries” and “televoting”, each with a 50% weighting – if you don’t know how it works, you can read all about it here. The televoting will take place in a live poll during the final show in the chat, but right now we are ready and waiting to receive your jury votes by e-mail. 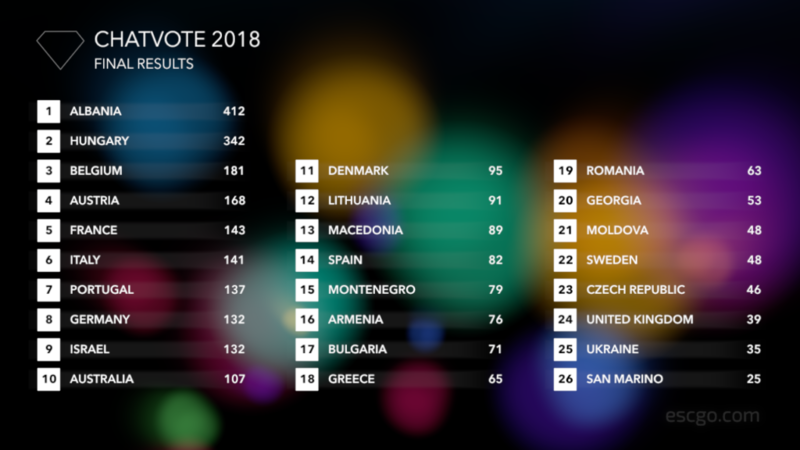 These are the votes that you will get to read out as usual, live in #esc during the grand final, which begins at 21:00 CET on Sunday 22 April. Simply send your votes in ESC style (12, 10, 8…) to vote@escgo.com by no later than 23:00 CET on Saturday 21 April. Please note that we can only accept votes from people we know to be #esc chatters, so do include your chat nickname in your e-mail in case of any doubt. You can also use the submission form at the bottom of this article to submit your jury votes! Either way, do check your e-mail for confirmation and get in touch with us if you don’t hear back from us about your votes. You can see the full list of finalists below. The “producers” have also randomly assigned the finalists to the first and second halves of the show and determined the draw order, which we will use when we preview our grand final in the #esc chat on the evening of Saturday 21 April (starting at 21:00 CET as usual). Please do also join us for that if you can – as well as being fun, it’ll be useful for helping you to make up your mind if you still haven’t voted by then! Deadline: Saturday 21 April, 23:00 CET. ChatVote 2018 season is launched! It’s time for us to launch ChatVote 2018! As you may know, our legendary chatroom, #esc, has been around for much longer than escgo! in its current form. This is illustrated by the fact that this will be the 14th edition of ChatVote, our annual event in which the #esc chatters decide which is their favourite entry from the forthcoming Eurovision Song Contest. If you want to read all about the previous 13 editions, check out our comprehensive ChatVote history page! ChatVote 2018 will follow a similar pattern to the recent years. That means live voting in the chat for the two semi-finals, live streaming of the envelopes revealing the qualifiers, and a big final event including a fast-and-furious “televoting” poll and a live-streamed scoreboard for you to follow the jury votes and the decisive televoting revelation. On Saturday 14 April and Sunday 15 April, we will gather in #esc to watch each of the semi-finals in the official running order. Everyone who attends will then be able to vote for their ten qualifiers in a poll, after which the lucky qualifiers will be revealed in our live stream. Once our qualifiers are known, the jury vote for the ChatVote grand final will be opened. 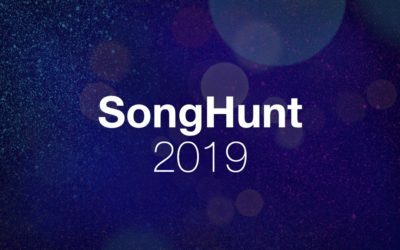 As usual, chat regulars will be invited to submit their jury votes by e-mail, and there will be a preview event in the chat on Saturday 21 April to help anyone who needs one last reminder of the songs – with a producer-determined running order to help our finalists really shine. Simply come and attend our semi-finals if you can, and vote your favourites through to the grand final! As usual, the jury voting for the grand final will open after the second semi-final – full instructions will be published then, so no need to e-mail us anything yet. A mini-calendar with all the important dates and times can be found below for your convenience. Portugal has won the 13th annual edition of ChatVote, the traditional event held by escgo! and the #esc chatroom to find our favourite song ahead of each year’s Eurovision Song Contest! In the 2017 edition, “Amar pelos dois” by Salvador Sabral received a total of 225 points, ahead of Koit Toome & Laura from Estonia in second place (197 points) and Blanche from Belgium in third place (186 points). Meanwhile, Australia propped up the table, receiving 17 points in last place. 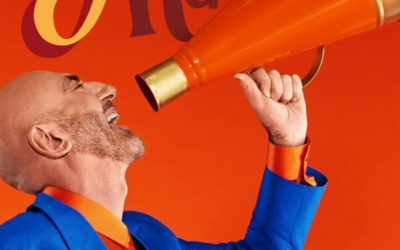 Repeating the new ChatVote concept we introduced last year, 50% of the total score was determined by “juries” – regular chatters who gave their votes in ESC-style (12-10-8…) – and 50% by “televoting”, which took the form of a fast-paced poll that was held live in the chat at the start of the grand final, with everyone attending the event welcome to participate and submit as many votes as possible in the five-minute voting window. 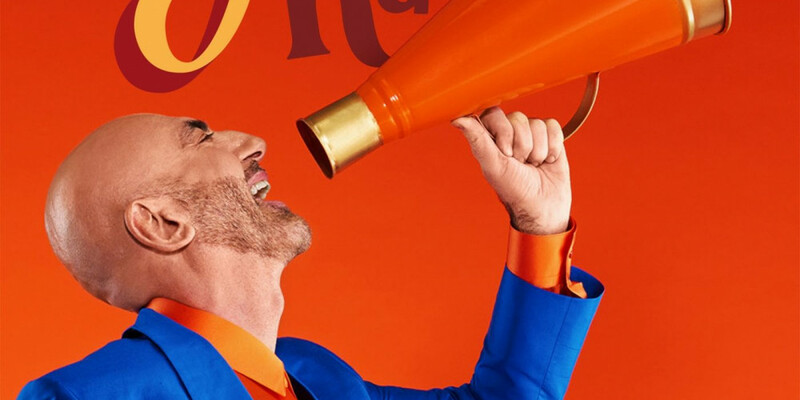 While Belgium won our jury vote, it didn’t receive anyone’s 12 points – so in hindsight, it was no surprise to see it overtaken in the televote where people tend to focus on voting for their biggest favourites. 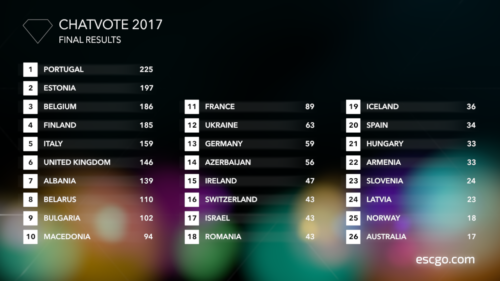 In any case, the live-streamed scoreboard of the televoting reveal was a fitting highlight to an exciting night in the chat – thanks to everyone who attended and took part throughout the various events of ChatVote 2017! 1. Belgium and Finland, 3. Portugal, 4. Azerbaijan, 5. Iceland and Armenia, 7. Latvia, 8. Slovenia, 9. Australia and Albania || 11. Sweden and Cyprus, 13. Greece and Czech Republic, 15. Poland, 16. Moldova and Georgia, 18. Montenegro. 1. Estonia, 2. Macedonia and Belarus, 4. Romania, 5. Bulgaria and Israel, 7. Ireland, 8. Hungary, 9. Norway, 10. Switzerland || 11. Serbia, 12. Austria, 13. Denmark, 14. San Marino, 15. Malta, 16. Netherlands, 17. Russia and Croatia, 19. Lithuania. So that’s all until 2018 – although there is the small matter of the 2017 Eurovision Song Contest for us to enjoy first. And while the #esc ChatVote is very much a preference poll, it can be fun to look back and see how our taste has corresponded to Europe’s over the years. As the ChatVote history shows, Salvador’s victory may not be an omen of success in Kyiv next month, but there is a possibility we might have got it “right” – just ask Lena or Loreen! So on behalf of all our voters, we wish Portugal all the best for ESC 2017. And now, enjoy our winning song! The ChatVote, previously also known as “#esc verdict” and by other names, has a long history dating back to its origins in our heritage chatroom #eurosong. 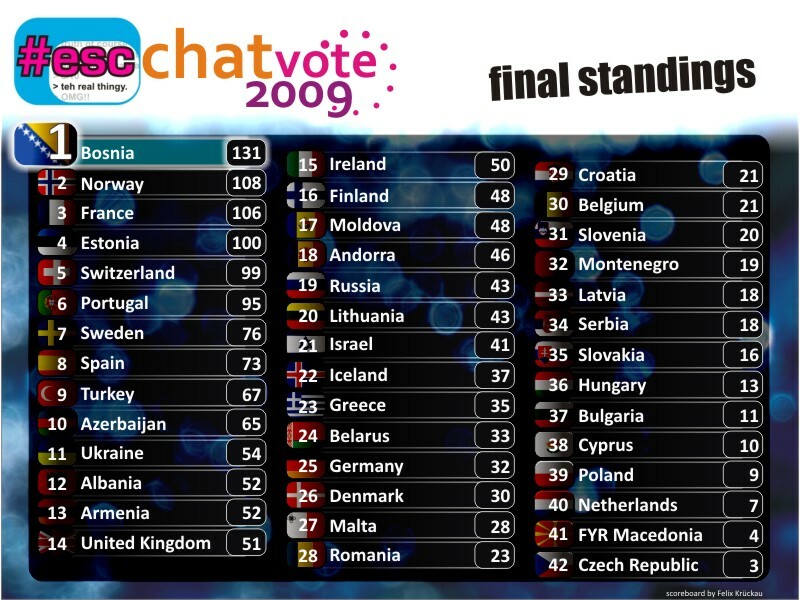 In its current format, the record book for the #esc ChatVote goes back to 2005, our first season as an independent chat. Here’s an overview of all the results since then! The 2018 edition of our ChatVote was won by Albania and “Mall” by Eugent Bushpepa. 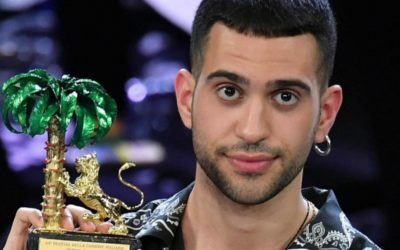 The ultimate winner of ESC 2018, Israel, narrowly won our jury vote but with just a handful of top marks, so it was perhaps no surprise to see it fall behind in the televote where chatters vote en masse for their favourites. Instead, Albania (which had finished a close second in the jury vote anyway) and Hungary benefited from huge support from the chatters in attendance on the night to take first and second place respectively, with Belgium some way back in third place. 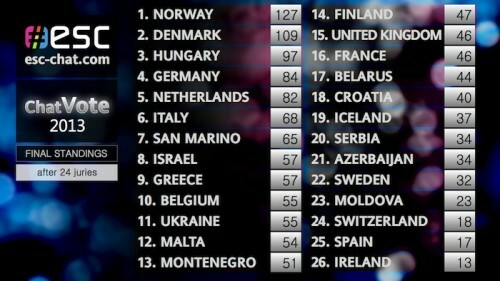 Meanwhile, San Marino and its robots finished last, but would probably have been quite content just to be in the final. The #esc ChatVote became a teenager with its 13th annual edition, won by the Portuguese entry “Amar pelos dois” by Salvador Sobral. 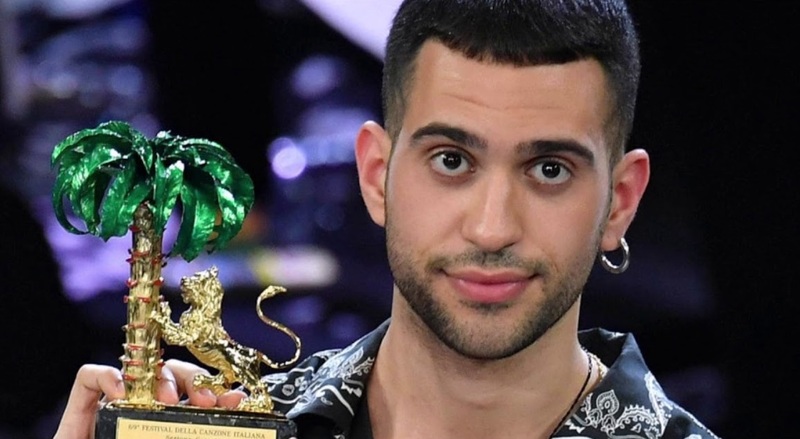 He triumphed thanks to a strong performance in the “televoting” part of the event, which was repeated following its successful launch in 2016. 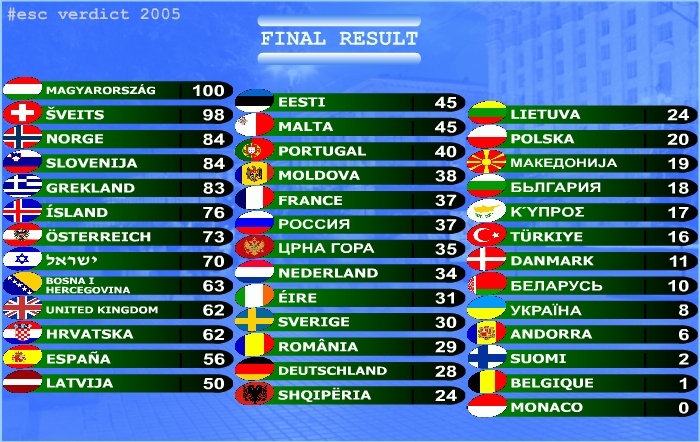 Portugal scored 225 points in the end, followed by Koit Toome & Laura from Estonia in second place (197 points) and jury winner Blanche from Belgium in third place (186 points). Meanwhile, Australia propped up the final table, receiving 17 points in last place – and poor Lithuania set a new record low by failing to receive a single vote in the semi-final poll. The change in the ESC vote presentation format was reflected in the ChatVote, with the introduction of a fast-paced five-minute “televoting” poll as part of the final event in the #esc chat to accompany the traditional juries. 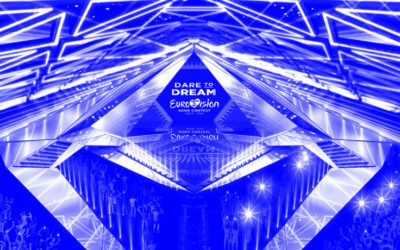 In another new development, the scoreboard was streamed live via YouTube, culminating in a live graphical presentation of the decisive televotes at the climax of the show. The eventual ESC 2016 winner, Jamala from Ukraine, was also leading the ChatVote after the jury phase, but the televoters swung the decision in favour of Justs from Latvia, whose “Heartbeat” took the #esc crown with a total of 305 points. Zoë from Austria and Poli Genova from Bulgaria completed the podium positions as the good old ChatVote took a big step forward in terms of excitement and entertainment. Slovenia won the #esc ChatVote 2015, the 11th edition of the traditional event – and the first under this website’s new name of escgo! “Here For You” by Maraaya took victory with 151 points following a head-to-head battle with “A Monster Like Me” from Norway, which ended up in second place with 138 points. The podium was completed by Estonia, which was the only other country to finish in three figures points-wise. At the other end of the table, Uzari & Maimuna from Belarus finished in last place with just 14 points. Israel won the ChatVote 2014, with Mei Finegold’s “Same Heart” taking victory ahead of the early bookmakers’ favourite Armenia (Aram Mp3) and the United Kingdom (Molly Smitten-Downes). The Netherlands, who would eventually go on to finish 2nd at ESC itself, took 4th place in our vote. At the other end of the table, Moldova finished in last place, and didn’t exactly do much better when the contest was held in Copenhagen! Norway won the ChatVote 2013. Margaret Berger’s “I Feed You My Love” took victory ahead of eventual ESC champion Denmark (Emmelie de Forest) and the surprise package of the competition, Hungary, whose “Kedvesem” finished third. Ireland and Ryan Dolan landed in last place after being overtaken by Spain right at the end of the voting. Notable casualties at the semi-final stage included Russia and Georgia. And for the first time, three “preview nights” were held in the chat with joint viewings of the semi-finals and the final! 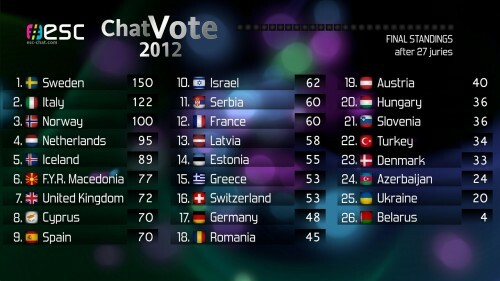 Sweden won the ChatVote 2012. 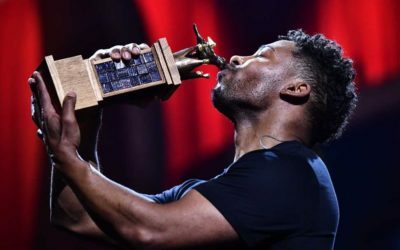 For the second time in just a few years (after 2010), the ChatVote winner was later crowned the actual winner of the Eurovision Song Contest! Loreen’s “Euphoria”, which turned out to be one of the biggest chart hits in Eurovision history, scored a total of 150 points in our own voting. Italy came 2nd with 122 points, while Norway finished 3rd with exactly 100 points. Last place went to Belarus, which collected 4 points. 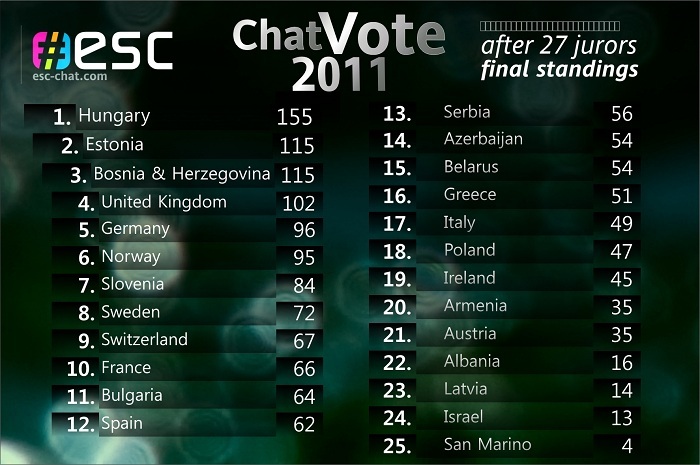 Hungary won the ChatVote 2011. Kati Wolf’s Eurovision entry “What About My Dreams?” scored a total of 155 points. 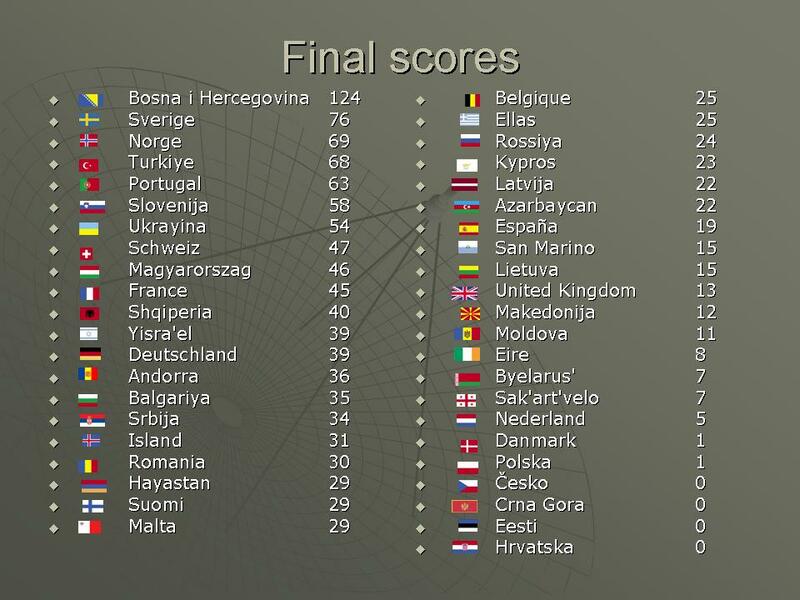 115 points went to Estonia (2nd) and Bosnia & Herzegovina (3rd), with the ESC tie rule applying. San Marino came last in the final with a total of 4 points. 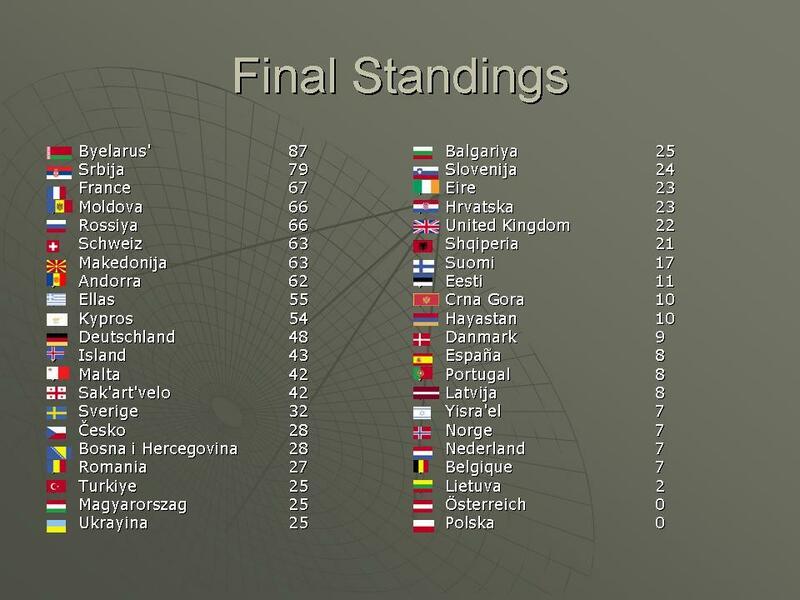 The least voted-for entries in the semifinals were Lithuania in semi 1 (2 mentions) and Moldova in semi 2 (4 mentions). 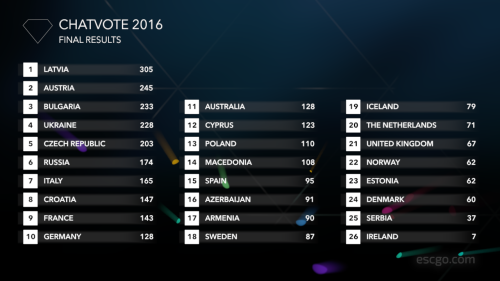 Both songs managed to reach the real ESC final, ending up higher than the ChatVote winner, Hungary (22nd). Germany won the ChatVote 2010 with Lena’s song “Satellite”, which was also the real winner of the Eurovision Song Contest, breaking with a long assumed law of nature that our winner is doomed for the real show. We also picked the 2nd place right, with Turkey (Manga) scoring 67 points in a tie with Israel (Harel Skaat, 3rd). We even managed to predict the placing of the United Kingdom correctly – 25th and last. 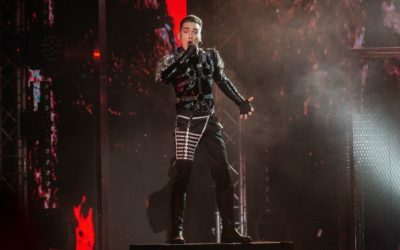 The show took place on 16th May after semi-finals were held for the first time. Bosnia & Herzegovina won the ChatVote 2009 with the song “Bistra Voda”, sung by the band Regina. It’s the second time in a row that the country won our annual poll. The dramatic ballad reached a final score of 131 points. The winning song of the Eurovision Song Contest, Norway’s “Fairytale” by Alexander Rybak, came 2nd with 108 points, while France came 3rd with “Et s’il fallait le faire” sung by Patricia Kaas. No country had to suffer a final score of 0 points. 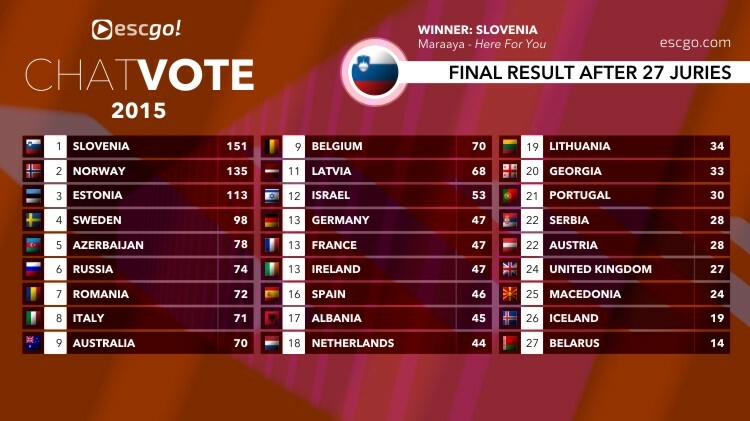 Last place was taken by the Czech Republic with “Aven Romale” (3 points). The contest took place on 30th April in the #esc chatroom. 32 chatters took part in the annual event. The show was hosted by “PhilipKirkorov” and “AllaPugacheva” and began at 21:00 CET. The final standings were revealed at 22:44. Bosnia & Herzegovina won the ChatVote 2008 with the song “Pokušaj”, sung by Laka. The song reached a final score of 124 points. Sweden came second with “Hero” (76 points), third was Norway (69 points). Last place was shared by the Czech Republic (“Have Some Fun”), Montenegro (“Zauvijek volim te”), Estonia (“Leto svet”) and Croatia (“Romanca”) with 0 points each. The contest took place on 3rd May, as always in the #esc chatroom. Some juries announced their points in a YouTube video. The show, which was hosted by “IngvildBryn” and “MortenHarket”, kicked off at 21:00 CET and lasted until 22:21 when the winner was announced. Belarus won the ChatVote 2007 with the song “Work Your Magic”, sung by Koldun. The song reached a final score of 87 points. Serbia’s “Molitva”, the winning song at the Eurovision Song Contest, came 2nd with 79 points, while France came third with “L’amour à la française”. Last place was shared by Austria (“Get A Life – Get Alive”) and Poland (“Time To Party”). Germany won the ChatVote 2006 with the song “No No Never”, sung by Texas Lightning. The song reached a final score of 172 points. 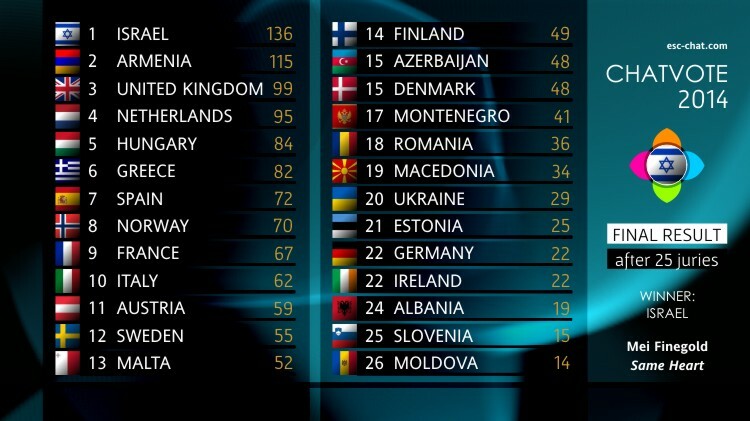 Belgium came 2nd with “Je t’adore” (122 points), while third was shared by Iceland’s “Congratulations” and Romania’s “Tornero” (103 points each). Israel and Cyprus share the last place with no points at all. The annual event took place on 30th April, and 33 chatters participated. Unfortunately, the full scoreboard graphic has been lost in the mists of time! Hungary won the “#esc verdict 2005” with the song “Forogj világ”, sung by NOX. The song reached a final score of 100 points. Switzerland came 2nd with “Cool Vibes” by Vanilla Ninja (98 points), while Norway finished 3rd with “In My Dreams” by Wig Wam. Monaco came last with “Tout de moi”.